Mother's Day is this Sunday but I'm getting my gifts TODAY! I took leave today as I wanted to do some packing (seems like we are running out of time!!!) before the big move. Daddy took half day too wanting to help me pack but in the end I told him that I do not need help as nothing much since I've packed most of the stuffs in the box (Lucky we did not unpack alot of things when we move in in Sept 2011). He volunteered to fetch Little DinoEgg from the school while I continue to pack and then get ready for dinner. I was starting to wonder what takes them so long (an hour plus) to come home coz it will probably take abt 45mins by taxi to & fro. I thought perhaps he was still having classes when daddy is at school so he let him finish the class before fetching him. 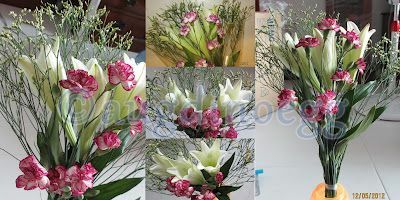 When they are finally home, they surprise me with a beautiful bouquet of white lilies & burgundy carnations! That's the reason why it took them longer the usual to come home. Little DinoEgg was eager to let me know that the white lilies are from daddy and burgundy carnations are from him. Awww~~ so sweet of them! 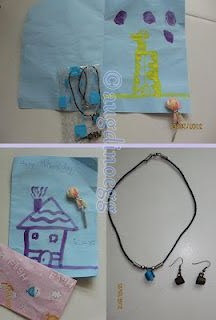 And Little DinoEgg made these for me in school. A beautiful self portrait card & a pair of ear-rings. 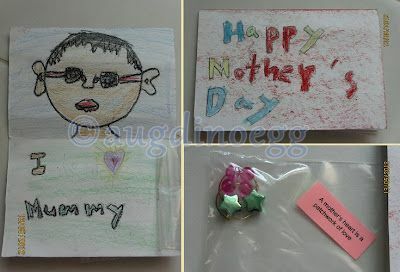 A little phrase "A Mother's heart is a patchwork of love". So touched! 2 great gifts to make my day! Then its time to get ready for the Mother's Day dinner with the Family! We decided to organise this since its been a while we got together. Initially wanted to go to Buffet Town but they were fully booked for today. So we head off to Kushin bo Authentic Jap restaurant instead. Since I'm on leave, I volunteered to fetch Farn & Han from sis' house since she is working, and we meet up the rest of the family at the restaurant. It was a great wonderful happy dinner, the food is good, the kids are well behaved, the adults enjoy the company and catching up with each other. Best of all, Mum is having a great time with her kids and grandkids. The Mummies received a card and a little gift from Megan. So sweet of her. 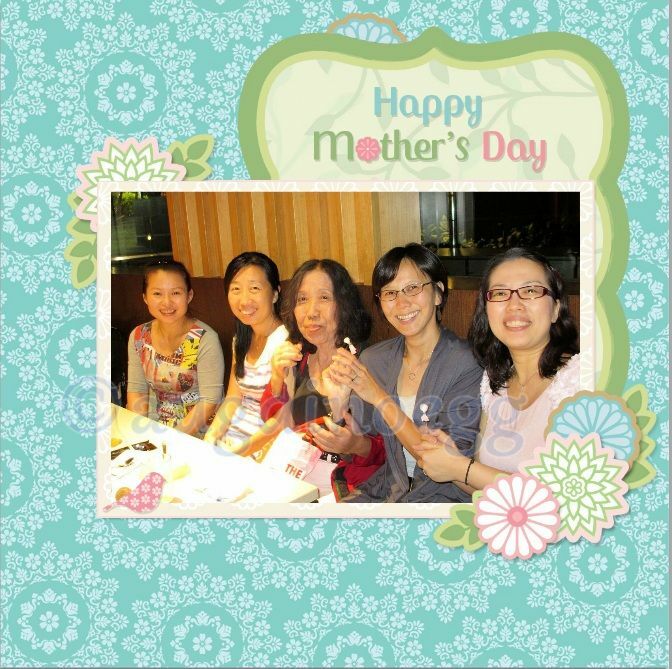 And so, here are the wonderful mothers (ya me included kekeke) of the night.